186 pages | 10 B/W Illus. 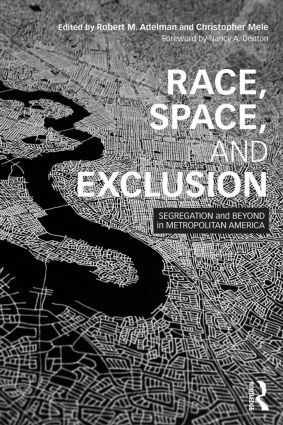 This collection of original essays takes a new look at race in urban spaces by highlighting the intersection of the physical separation of minority groups and the social processes of their marginalization. Race, Space, and Exclusion provides a dynamic and productive dialogue among scholars of racial exclusion and segregation from different perspectives, theoretical and methodological angles, and social science disciplines. This text is ideal for upper-level undergraduate or lower-level graduate courses on housing policy, urban studies, inequalities, and planning courses. Robert M. Adelman is Associate Professor of Sociology at the University at Buffalo, SUNY. An urban sociologist studying social stratification in the U.S., Adelman analyzes patterns, trends, and processes related to residential segregation and neighborhood inequality, immigration, internal migration, and labor force differences by race, ethnicity, and nativity. A former Book Review Co-Editor for City & Community, Adelman currently serves on the journal's editorial board. Christopher Mele is Associate Professor of Sociology and Adjunct Associate Professor of Geography at the University at Buffalo, SUNY. His research interests include the geography of race and exclusion, neoliberalism, and global urbanism. His recent publications appear in Urban Studies and the International Journal of Urban and Regional Research. He is co-editor (with Jan Lin) of the Urban Sociology Reader, Second Edition. This series brings original perspectives on key topics in urban research to today's students in a series of short accessible texts, guided readers, and practical handbooks. Each volume examines how long-standing urban phenomena continue to be relevant in an increasingly urban and global world, and in doing so, connects the best new scholarship with the wider concerns of students seeking to understand life in the twenty-first century metropolis.